The Austin Teacher Program aims to educate individuals who will be active learners in their personal and professional lives, who will become dedicated and creative teachers, and who will be educational leaders in their schools. The program’s graduates are equipped with a strong curricular base and an ability to evaluate the needs of their students and their classrooms and to determine the best approaches to meet those needs. So say the Austin College faculty members who prepare those future teachers. A look at ATP graduates confirms their descriptions. Program alumni are teachers, principals, superintendents, coaches, athletic directors, and policy makers. 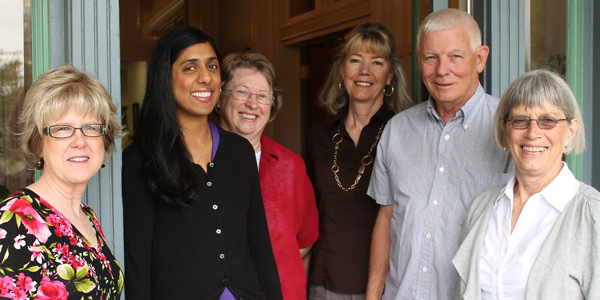 The program’s faculty members are committed to a unified philosophy of educating their students. They offer a constructivist approach, instructing not by telling—“This is what you do”—but by asking—“What does effective teaching look like?” And the students discover the answers for themselves, each developing a professional teaching philosophy and persona in the process. 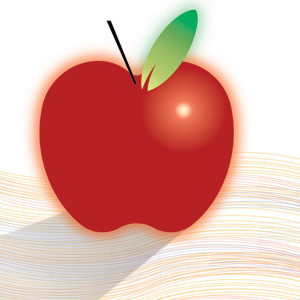 The Austin Teacher Program is a five-year program culminating in a Master of Arts in Teaching degree. Students undertake their Austin College education and complete majors and minors based upon their areas of interest. They also will take three undergraduate courses in teacher education along with other professional courses and, in the last semester of study, apply to the graduate program. Barbara Sylvester, ATP chair, agrees. “Part of the strength of our program lies in the preparation students receive as undergraduates both in their content areas and in the liberal arts tradition,” she said. 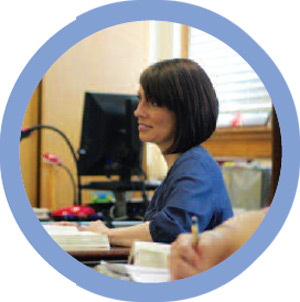 A hallmark of the Austin Teacher Program is the practical experience in teaching that begins with the first course and continues through the last course. The first undergraduate course offers a critical study of “Schools and Society,” examining issues of effective teaching and productive schools, as well as issues of equity, special needs students, bilingual education, and policy-making in education. And critical to the course, students spend time in a classroom to observe the daily reality of the issues under consideration. 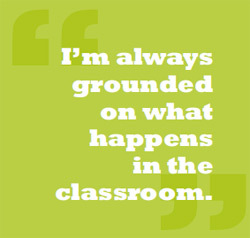 Classroom observations grow into teaching experiences. During the second undergraduate course, students spend 30 hours in the classroom (45 as of this fall), observing and assisting, and by term’s end, teaching at least five lessons. The next course includes 45 hours in the classroom, but this time, the future teachers are responsible for an hour of teaching each day during eight of the nine weeks. These experiences serve to demystify teaching, according to the faculty, allowing the future teachers to discern what they do know and what they don’t know and need to work on during the graduate portion of the program. “The combination of theory and practice students receive in our field-based experiences—that are an integral part of our courses—allows them to reflectively grow at a faster pace than they would without the time in schools,” Barbara said. Once accepted into the graduate program, classroom observation and teaching components increase progressively to the student teaching semester. ATP faculty members observe students and offer feedback and coaching, and the future teachers continue to reflect upon their experiences and critically assess their teaching and the classroom experiences. With challenges ranging from budget cuts to discipline issues to test-score-bound success ratings, teaching in today’s schools is tough business. But for those who want to be teachers, each hardship is another issue to be analyzed and addressed—something else the members of the ATP faculty want students to expect and be prepared to manage. on the Austin College campus. Sandy remained at the school for four more years, then felt she had come to realize some of the difficulties of the teaching profession and wanted to help prepare young teachers to face them. She entered Stanford University to complete a Ph.D. in curriculum and education. 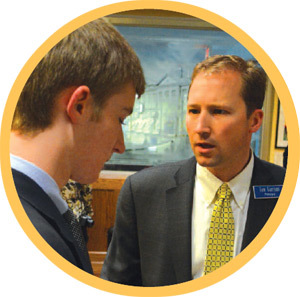 Thomas Garrison ’06 has seen everything at Jesuit College Preparatory School. “The only time being back at Jesuit as a professional threw me was early on with my former teachers still working here. Now that I have the position I have, it’s been fine, but every now and then, I think it’s a little ironic. I’ve got a lot of good relationships with people who taught me, and now they’ve become my coworkers and colleagues,” he said. Tom just completed his first year as principal at the private school in Dallas. He graduated from Jesuit in 1992 and earned his Austin College bachelor’s degree in psychology in 1996 and master’s degree in secondary education in 1998, which resulted in a teaching internship at Jesuit. The internship turned into teaching English full time in 1998 and appointment to assistant principal of academics in 2003. 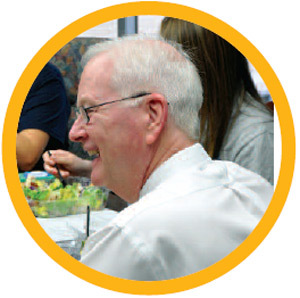 In July 2011, Tom became the principal at Jesuit. Jesuit is a Catholic-affiliated all-male school for approximately 1,000 students in grades 9 through 12. The faculty totals 111 and includes Jesuit priests and lay men and women. The school has seen more than 8,000 graduates since its beginnings in 1942. Tom knows his school environment changes things, and he has a close understanding of the differences—his wife, Allison, is a high school art teacher in a public school in Plano. That kind of reflection is iconic of Tom’s style. It’s something he learned from the Austin College Teacher Program and maintains today. 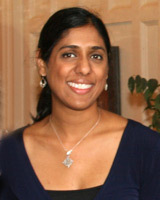 Amanda Patterson Valenti ’04. “I deal with kids who cannot tie their shoes or walk straight in a line and then with high schoolers and the typical issues teenagers go through—all in one day. The variety of learning, conversation, questions, problems, and answers gives me a challenge that I love. I never have a boring day!” Amanda said. Amanda is head swim coach at Plano East High School as well as the physical education teacher for kindergarten to second grade at Rasor Elementary School. After her Austin College graduation with majors in exercise and sports science and psychology and a master’s degree in secondary education, Amanda accepted the teaching position at Rasor Elementary, in the district in which she grew up. Happenstance joined with her swimming experience—Amanda was on the varsity swimming and diving team all four years at Austin College—to create her unusual position. “During teacher in-service, I ran into a former coach, who was the head swimming coach at Plano Senior High. I asked if he needed any help with his team and my principal gave me permission to volunteer as his assistant coach,” she said. Her biggest challenge, however, covers all grade levels. “Class size is always a challenge, even for PE. Ideally, a class of 20 would be great, but I usually have 60 at a time. It is hard to be able to allow for each child to have his/her own piece of equipment when the class size gets larger. This is a challenge in the grade levels, too … classes keep getting bigger, and budgets seem to keep decreasing,” she said. While it can be a struggle to balance class sizes with student needs, Amanda came into teaching feeling prepared. 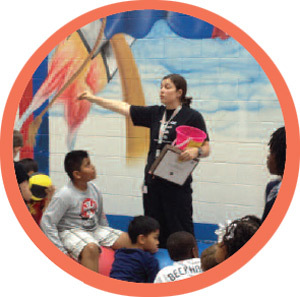 “The Austin Teacher Program (ATP) especially prepared me for my own teaching. We were constantly discussing diversity and cultural changes and how to adapt lessons to allow each child to learn at his or her best. The innovation of the ATP is what I enjoyed the most. … What is current? What is upcoming? What would best fit my classroom?” she said. The challenges of working with both polished athletes and tripping kindergarteners have produced rewards, however. After only a year of volunteering as assistant swim coach, she was offered the full-time coaching position, and this year was named Experienced Teacher of the Year at Rasor Elementary School. Otis Amy ’89 always was looking for an edge. At Austin College, he found that advantage not just in athletics, but in education. “Austin College is an awesome training ground for educators. My background from the Austin College teacher education program gave me a competitive advantage over my peers,” he said. Otis earned his bachelor’s degree with an emphasis on physical education, and his master’s degree in education. He also founded the Black Expressions student organization and even lettered in basketball one year. He came to Austin College partially because of the athletics program, but has found his education has helped him succeed as a school administrator. 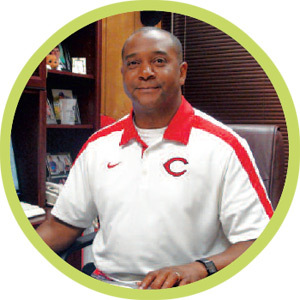 Today, Otis is principal at Carthage High School, where he also attended. “As an administrator you have to balance the agendas and interests of all stakeholders—students, parents, administrators, central administrators, school board members, community leaders, etc.,” he said. Remembering the community from his own youth has helped. “I know a lot of the personnel, students, and parents. Also, having lived here, I know the culture and expectations of the school and city,” Otis said. “The greatest challenge is balancing self, blending personalities, interests, agendas, rules and regulations, and professional ethics while simultaneously keeping student achievement at the forefront,” he said. But the challenge also is a benefit: “No two days are the same,” he said. He has had an unusual career. After graduating from the Austin Teacher Program, Richard Matkin ’74 worked as basketball coach, teacher, bus driver, and director of operations, and this May, was named superintendent of Plano Independent School District. “I’ve been at a lot of great places and could have stayed at all of them my whole career, but with the CPA and education background, I was able to get to the highest level,” Richard said. That’s right—he’s also a certified public accountant. After teaching history and math for a few years, he started night school in accounting. His children were young, and his wife, Deborah (White) ’74, was a stay-at-home mom. Teaching was satisfying, but he hoped accounting would provide a little more stability. But, unexpectedly, after he completed his certification, Richard found himself back in education. “I got the experience out of the way and then I found my way back to schools. I missed the education part, and had the opportunity to get a business manager’s job in Red Oak ISD,” he said. Richard joined Plano ISD in 2001 as chief financial officer and head of business finance. In that role, he was responsible for the district’s finances, as well as demographics, facilities, transportation, food, and nutritional services. He served as interim superintendent beginning in February, and the school board selected Richard for the top position in April. Darcy White Young ’94 was not interested in classes in which she would see her parents—Drs. John and Jane White, both associate professors of education in the Austin Teacher Program (ATP). But she took her time getting there. After earning her bachelor’s degree, she moved to Ashland, Oregon, where her brother was acting with the Oregon Shakespeare Festival. “I worked in restaurants, substitute taught, and went to as many plays as I could. It was a great time in my life, but intellectually and professionally unfulfilling,” she said. Darcy had only three classes taught by her parents in her five years on campus, but she has become a strong advocate for the program they help to lead. Darcy is now an English teacher at Highland Park High School in Dallas. Though she initially struggled with the idea of following in her parents’ footsteps, she is certain she found her vocation.